Champagne is a world famous region, located in North Eastern France. The Champenois vineyards are planted only with Pinot Noir, Pinot Meunier and Chardonnay; grapes. These magnificent vineyards stretch as far as the eye can see over rolling hillsides, dotted with picturesque villages. Behind these billions of bubbles is a long history; and it wasn't until the late 17th Century that the tart wines of Champagne became the sparkling wines that we all know so well today. Our walks take us through this lovely undulating countryside - past vineyards, gorgeous oak forests and beside swift flowing streams. The Alsace region, nestled between the Rhine River and the Vosges Mountains, is one of France's most unique areas. It is blessed with a wealth of beautiful scenery, cultural sights and is famous the world over for its fine white wine and delicious cuisine. The storybook villages with their Tudor style houses are an absolute delight. 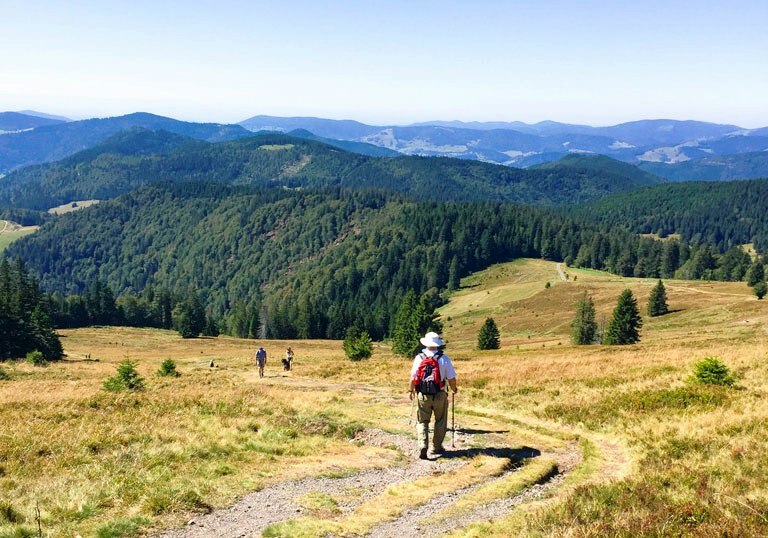 Our walks take us along the famous wine route and into the glorious deciduous forests of the Vosges. We learn about the areas Celtic heritage and visit some of Europe's finest old castles and monasteries. 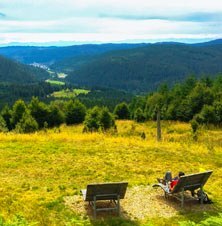 The Black Forest has always been a region, which conjures up images of deep dark forests with winding romantic paths, picturesque valleys and cozy timber farmhouses. Discover a fairytale landscape as we walk our way through some of Southern Germany's most beautiful countryside. Its stunning beauty which includes pristine mountain streams, alpine meadow and hillsides ablaze with wildflowers allow you to step back in time and imagine what ancient Germany might have once been like. Our first hotel is directly on the border of Champagne and Burgundy; so we have the best of both these famous food and wine regions. Our hotel has been an absolute labour of love by the Vandendriessche Family during the last 10 years. Nestled in the tiny village of Courban is the enchanting Chateau de Courban. This noble, classical mansion enclosed by ancient stone walls, has been rebuilt in 1839 on the foundations of a 17th century castle, of which is left a beautiful tower housing a dovecote. More recently the family have lovingly restored the chateau and have established a charming boutique hotel. 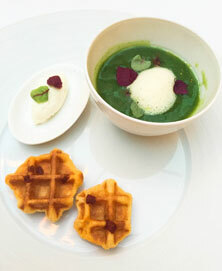 Enjoy a delicious cuisine highlighting the specialties of two of France's most famous food and wine regions. 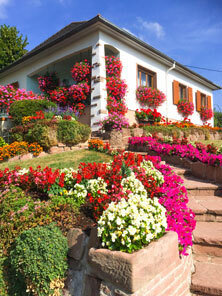 Our hotel in Alsace is situated in one of France's most beautiful villages - Obernai. ; Our hotel was once the former manor house and wine cellar of the distinguished Baron de Gail Family and is now one of the premier hotels of the region. After a day of walking you will certainly look forward to relaxing in their brand new wellness centre. In the evening enjoy fine dining in their excellent restaurant where you can also sample some of France's premier white wines. In the Black Forest we stay in the charming village of Menzenschwand. Our cozy family hotel is located on the edge of the village at the beginning of one of the most beautiful valleys in Southern Germany. Typically German, the day begins with a healthy breakfast buffet. Before dinner enjoy a pre dinner drink in the cosy Black Forest bar. At night enjoy delicious home cooked meals as our hosts, Sabine and Sylvia, introduce us to the gastronomic delicacies of this region. Departure dates have been arranged to allow the "A Taste of Europe", "Eastern Circuit" and "Explore Croatia & Slovenia" walks to be combined. This being my third Walkabout trip I knew what to expect from previous experience. It certainly did not let me down. 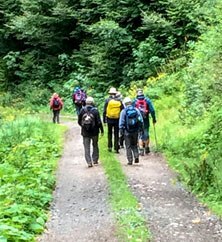 Under the expert., learned and convivial leader Graeme, more than ably supported by our French guide Pascal we were all treated to a superb walking holiday. My three loves, walking, delicious food and quality accommodation were all met in abundance. This, with an amazing, friendly and good-natured group of fellow walkers made for a wonderful experience. 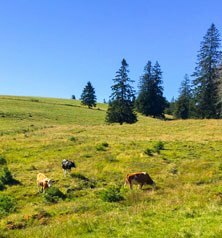 The weather was kind to us and helped us to appreciate the Countryside of the Champagne region, Alsace and the Southern Black Forest. Staying at the Michelin starred Chateau Courban for the first three nights painted the picture of the quality to expect for the rest of the trip. 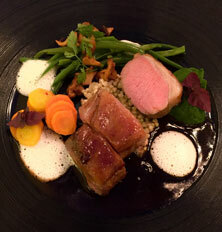 Superb accommodation, attentive staff and top-class cuisine from their Japanese chef. Obernai's Hotel à la Cour d'Alsace was excellent too and we were spoilt by the attention of Sabine and Sylvia at the charming Village Hotel Siberfelsen. 160 kilometres in 9 walking days was stimulating, invigorating and challenging at times. As well as the enjoyment of the trails themselves we always guaranteed a worthwhile historic and/or stunning view. In conclusion I thoroughly enjoyed every aspect of this trip. The people, the places and the well-planned walks. Thanks Graeme and Pascal for all you did for us." Another memorable holiday with Walkabout Gourmet (our fifth). The three different locations provided a variety of walks and scenery, as well as delicious cuisine. 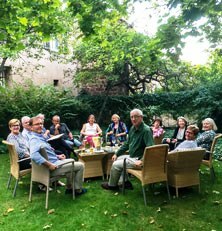 After a long day's walking in Alsace, it was a delight to arrive at a little pâtisserie in the wine village of Barr, where we all enjoyed delicious treats such as 'tarte aux framboises'! The electric-bike ride in the Black Forest on the free day also provided an exciting diversion. Great group of fellow walkers - good company and lots of laughs! Special thanks to Graeme and Pascal." A great holiday with probably the best company' we have experienced. Accommodation was great and staying 5nights at 2 hotels was a blessing not having to pack so much. The was excellent especially in France. The walks were very enjoyable despite being a little harder than I had expected but were quite manageable. All in a great holiday." We loved our first WG tour. Graeme and Pasquale were wonderful guides: knowledgeable, friendly, helpful, discerning, patient! Food was great (especially at Courban). We loved the walks - they got better and better - and the scenery was all beautiful. Accommodation very good and we really enjoyed getting to know the group. Lots of drinks, food, conversations, great walks and laughter." The variety of walks was excellent across the three locations. It was great to complete in the Black Forest with improved level of fitness for us by then. The food experiences and bubbles in Champagne were not to be beaten. Such artistry in presentation and flavours each night was a definite treat. 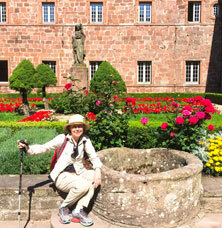 The flower villages in Alsace delightful too, not to forget the cakes to entice at the end of the longest days walks. Thanks Graeme and Pascal you were both fantastic guides, whatever happened to those goats? I wonder. It was good to be able walk at our pace even if slightly faster than some in the group. Good advice given re-use of poles. It was a great group, thanks to everyone for being so friendly and fun to walk with." Even some miserable weather could not dampen my praise for this journey. I think my fellow travellers will agree. They were a great group. There were so many highlights...but really I must single-out Graeme, for the organisation and management of the tour, and Pascal for his warmth and generosity at all times. The chateau and the food in Corban... amazing. A real taste of Alsace in beautiful Obernai. An amazing experience with Sabine & Sylvia at the hotel in Menzenschwand. Some of the walking was challenging but never more than the party could handle. The scenery and destinations were wonderful. Now where to next..."
My first trip with Walkabout Tours. What a wonderful experience... Would certainly recommend them to anyone. We would never have found our way along some of the tracks without our trusty guides, Graeme and Pascal. The views at the top of the mountains were spectacular... I just wish it had not been so hot. We did not need the heat wave that struck as we started the walk... Thank you for a great holiday!" This was my first trip with Walkabout Gourmet but not my last! An exceptional experience! We were extended but not over extended. Graeme soon knew and understood each individual's capacity and we thrived on the attention and interest he gave (even with the wicked fibs he told to motivate us). We had just the right amount of walking, free time, eating, drinking and relaxing. Thank you fellow travelers and thank you Graeme"
Absolutely wonderful ! In every aspect..."
Second walk with Walkabout Gourmet. Definitely a five star experience. We experienced places that we would never have found for ourselves. A highlight for me was walking alongside a shepherdess (with her crook), bringing her sheep down from the meadow. The extra litte bits of information provided by Graeme along the way just added to the overall enjoyment. Just fantastic and highly recommended"
Our fourth Walkabout tour and we thoroughly enjoyed it. Hoping to do more." We thoroughly enjoyed our walking trip, ''a little up and a little more down" was Graeme's catch-cry and so it was. We had great fun with Graeme and Pascal (who we introduced to Australian slang) and would recommend these trips to anyone seeking good company, food, wine and of course exercise. We hope to be able to enjoy another walk in the not too distant future. Thank you Graeme and Pascal, it was great. We enjoyed our walk. Great company and the best food and accommodation of all our four walks. Well done to our guides for answering the constant question...."are we there yet" and...."how many Ks to go"?